In the fall of 2016, driven by a year of severe drought, wild fires raged near my home in the NC Smoky Mountains. WHen I delivered supplies of honeybees and eyedrops to the nearby staging area, the Fire Marshall shared that the fires produced unprecedented balls of fire that leapt from treetop to treetop. It was a type of fire more typical of the western states than a temperate rain forest. The reality of global warming compelled me to respond with a sense of urgency expressed in this painting. 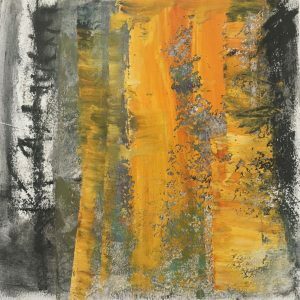 The painting is a small work (8″x8″) on Arches oil paper. The media is charcoal and cold wax/oil. “In my paintings I imagine and long for the hum of a sacred regard for the Earth.